As you may have noticed, at regular intervals throughout the year, our teachers ask our children to draw pictures of themselves. Sometimes we give children mirrors during the self-portrait process so they can observe the details of their faces. Other times we may ask the children to draw their whole bodies (the Adventurers class does this in the fall). These drawings help us learn more about our preschoolers in several ways. 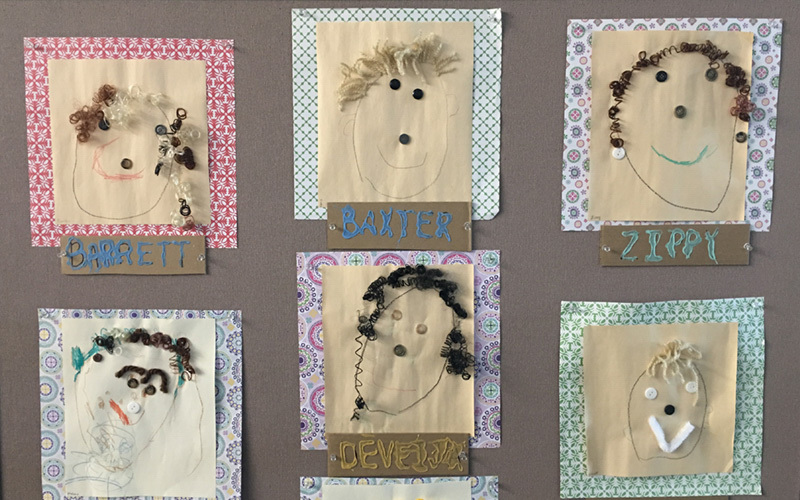 Through their self-portraits, we can assess a child’s fine motor skills. In addition, self-portraits give us a clear picture of a child’s awareness of his/her own body. Body awareness is an indication of a child’s perceptual awareness. The details of children’s drawings increase as their awareness of the world around them increases. We compare several drawings of a child’s self-portraits over time to get a clear idea of how the child’s self-awareness and his/her awareness of the world is progressing. Collecting self-portraits is an important tool in our documentation process of a child’s growth. Thank you to all of our families who donated eggs for our Spring Egg Hunts next week. Our hunts will take place immediately following carpool on Wednesday, April 17th on the Preschool Playground. It has been our long-standing tradition to donate eggs to our friends at Keystone Learning Academy for their egg hunts. We appreciate our Preschool community continuing to support this endeavor each year. Our families are egg-cellent!